The 1980s was a decade of discovery of evidence for great earthquakes in the Cascadia Region. Tom Heaton and Hiroo Kanamori published a paper asserting the Cascadia Subduction Zone was indeed actively deforming and is likely to produce great earthquakes. Heaton followed this paper up with a paper about PNW Native American stories that inferred their people were impacted by tsunamis in the not too distant past. In the 1990s, PNSN Research Scientist Ruth Ludwin began collecting and organizing other Native American stories and traditions that seem to be related to earthquakes and their effects on the people of Cascadia before westerners arrived. 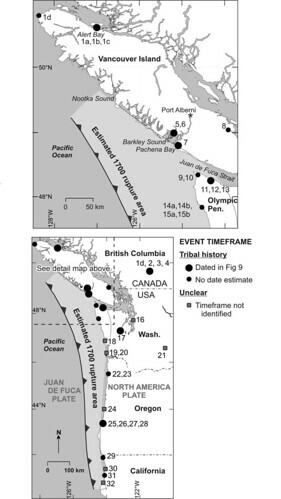 Brian Atwater, David Yamaguchi and others produced detailed evidence of abrupt land level changes and tsunami inundation along the coast of Washington state in the winter of 1699-1700. Further work in the 1980s and 1990s refined our understanding of the great earthquake that occurred on January 26, 1700 at about 9 PM PST. 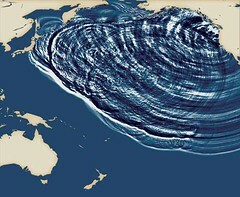 The amazing specificity of date and time came through collaborations with Japanese scientists and historians who helped identify the Cascadia Subduction Zone as the source of a deadly “orphan tsunami” that flooded areas on the coast of Japan the following day. Over the past 3,500 years these great earthquakes (~M9) have reoccurred 7 times with a average interval of 550 years though 4 of the events reoccurred between 200 and 400 years after the previous great quake. This research renewed interest in understanding how these events may have impacted the many thousands of Native Americans living here. Pacific Northwest Indian tales and legends related to the 1700 megathrust earthquake and found a set of related stories that, taken together, indicate that strong shaking was felt over a wide area and accompanied by severe coastal flooding. Native traditions tell of shaking and flooding along the Cascadia coast and estimate the date of the last earthquake by using stories that count the number of generations since its occurrence. 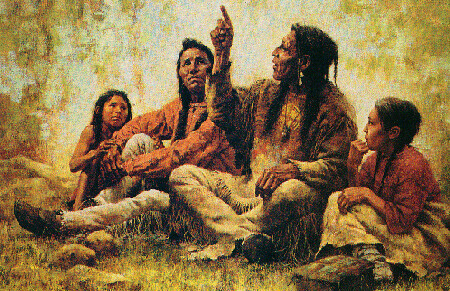 These stories are common among the native people in the Pacific Northwest. For further reading about dating the 1700 Cascadia earthquake and Native American stories, please go to Dating the 1700 Cascadia Earthquake and Native Lore Tells the Tale. Acknowledgement: Former PNSN Research Scientist Ruth Ludwin spent years studying stories and artwork of Pacific Northwest Tribes and is the original author of the vast majority of materials presented in this chapter. Ruth has retired from the UW and is currently living in Seattle.